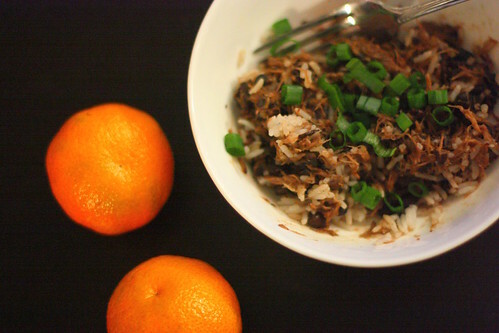 Winter evenings, and slow-cooked feijoada. Last month, I fell in love with a slow-cooked ham shank. Have you tasted the meat off a ham shank that has been cooking for eight-plus hours? It's magic. Fall-off-the-bone-tender, flavor-that-clings-to-every-ingredient, silky-shredded-meat, magic. Thus began an obsession with my slow cooker. In the past two months, I have used my slow cooker four times, and my parents' slow cooker once. It all started with Brazilian feijoada, which I discovered after a coworker brought in her leftovers for lunch one day and was gracious enough to share. Feijoada (fay-ZWAH-dah) is a stew typically served in South America, and includes beef, pork and beans. This particular recipe called for boneless pork shoulder, beef short ribs, ham hocks (did you know that ham hocks and ham shanks are the same thing? ), bacon and black beans. In a word: YES. So I got the recipe, and made it for my sister and brother-in-law on one of our many board game nights, and served it with rice and juicy Satsuma oranges. For appetizers, we had Renn Faire mushrooms that had been frozen since the summer and simmered back to life, with crusty bread to dip in the broth. After dinner, we video chatted with my other sister and brother-in-law in California. It was a good night. Add that one to the list. I had trouble finding ham hocks, but finally ended up at Whole Foods, where the butcher told me that ham hocks and ham shanks are the same thing. This recipe doesn't mention anything about removing the meat from the shank and returning to the pot once it's done, but mine had so much meat on it that I couldn't possibly just toss it. Next time, I might just use the pork shoulder and ham hock, and skip the beef short ribs altogether. Another thing: this stuff freezes beautifully. In fact, that last photo up there is of the leftovers I ate just a few days ago. Thaw in the fridge and put over low heat on the stove, with just a splash or two of water to add a bit more moisture. And finally, the oranges really do add a nice, refreshing touch. Cook bacon in a large skillet over medium heat until crisp. Remove bacon from pan and set aside. Sprinkle pork evenly with 1/8 teaspoon salt and 1/4 teaspoon pepper. Increase heat to medium-high. Add pork to drippings in skillet; sauté 8 minutes, turning to brown on all sides. Transfer pork to a 6-quart electric slow cooker. Sprinkle ribs evenly with 1/8 teaspoon salt and remaining 1/4 teaspoon pepper. Add ribs to skillet; cook 3 minutes on each side or until browned. Place ribs in slow cooker. Add drained beans, remaining 1/2 teaspoon salt, onion, and next 3 ingredients (through ham hock) to slow cooker, stirring to combine. Cover and cook on LOW 8 hours or until beans and meat are tender. Remove ribs from slow cooker; let stand 15 minutes. Remove meat from bones; shred meat with 2 forks. Discard bones. Remove ham hock from slow cooker, and shred the meat off the bone. Discard bone. Return beef and ham to slow cooker. Stir in vinegar and crumbled bacon. Serve with orange wedges and rice. Oh that was such a delicious meal...wonderful, fatty, meat goodness. And the oranges to brighten and refresh the palate. Awesome! Thanks for making that, Jacqui! Anything that has been slow cooked or braise-ified in the winter makes my soul smile. Sounds warming and wonderful! J - Glad you liked it! I love cooking for you guys. A Plum By Any Other Name - My soul smiles for winter foods, too. Thank you! Les - Yes! Do it! Tell me how you like it. 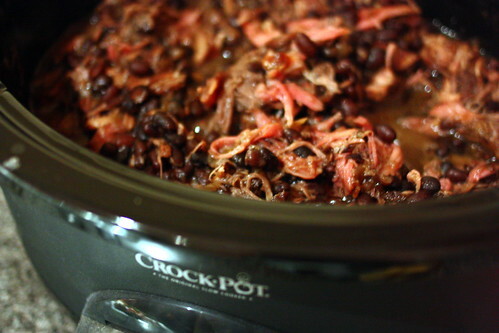 This is just the sort of dish I love...slow cooked meat and beans kinda dish :) Oh how I am tempted to get a slow cooker! ChichaJo - My slow cooker is my new best friend. Although I bet this would work on the stove top, as well! You would just have to adjust the liquid and the cooking time.